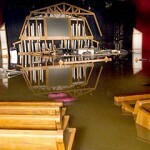 The devastating floods in Nashville have inundated the Grand Ole Opry House, the most famous country-music venue in the world, and damaged cherished equipment of country artists across Music City. 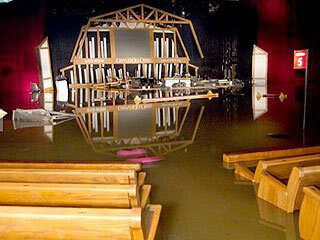 Songwriter Aimee Mayo posted a photo to Twitter on Wednesday, sent to her by country star Kellie Pickler, showing the flooded main hall of the Opry, which sits five miles northeast of the entertainment district. Many instruments, costumes, audio tapes and other historic paraphernalia are feared lost or damaged at the site. However, Opry performances have been moved to other Nashville venues. Other facilities are also swamped, including Soundcheck, a rehearsal space on the Cumberland River where Keith Urban and many other artists keep their gear. “I’ve probably lost all of my road equipment, and all my guitars, and amp and everything,” Urban tells CNN. 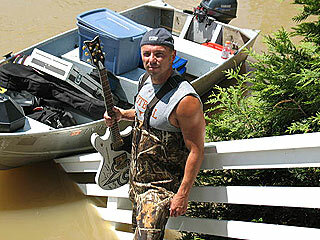 Kenny Chesney knee-deep in floodwater. Add Kenny Chesney to the list of celebrities who’ve been affected by the severe Tennessee floods. On Wednesday, the country star demonstrated just how serious the situation is by posting a photo on Twitter of himself nearly knee-deep in water. 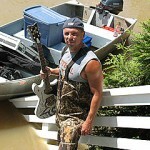 He can be seen clutching a white electric guitar while standing next to a small motorboat filled with several items, including a plastic storage box and a guitar case. “Sending Anderson Cooper footage of my house under water,” the singer, 42, Tweeted Wednesday, a few hours before he was scheduled to appear on CNN to discuss the damage. While the Grand Ole Opry has moved this week’s shows to other venues, the Country Music Hall of Fame is closed due to basement flooding – though its collections reportedly have not been damaged.